Coyotes are often mistaken for small to medium sized domestic dogs. They have a long, bushy black-tipped tail, pointed ears and a narrow pointed face. Their fur varies in color, from light brown to grayish. The fur on their belly is usually white. Coyotes are known for how well they adapt to different habitats. They can even be found living in and around large cities. In the Sonoran Desert, coyotes can be found in all habitats from desert scrub, grasslands, foothills as well as in populated neighborhoods. Coyotes can be found throughout North America from eastern Alaska to New England and south into Mexico and Panama. Currently the coyote population is stable. They are not listed as threatened or endangered. Coyotes are omnivores, which means they will eat or try to eat just about anything. 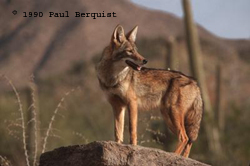 In the Sonoran Desert coyotes vary their diet with the seasons. Cactus fruit, mesquite beans, flowers, insects, rodents, lizards, rabbits, birds, and snakes make up some of their dietary choices. Coyotes have a central den site which is used for rearing the pups and sleeping. They will scent mark the area around the den and defend it from other coyotes. The den can be a burrow dug into the ground, or under a rock outcropping, a tree or a bush. If the area gets disturbed the mother will often move the pups to a safer location. Coyotes "sing" as a way to communicate with other coyote families and as a way to keep track of their own family members. Because coyotes are not picky eaters, they have even been known to eat domestic cats and small dogs. Compare with a Dingo of the Australian Desert.